Cuban police were called to keep the crowds at bay after Beyonce and husband Jay-Z were mobbed in Havana. Beyonce and Jay-Z were celebrating their 5th wedding anniversary in Havana when they were surrounded by dozens of well-wishers. The law enforcement officers arrived at the renowned restaurant La Guarida on Wednesday night. Their bodyguards’ presence outside set the gritty, bustling neighborhood of Centre Havana abuzz, and a crowd gathered downstairs shouting Beyonce’s name until she went to a balcony and waved. Waitress Silvia Fernandez said Beyonce toured the eatery and looked at photos of past celebrity clients including Jack Nicholson, Jodie Foster, Danny Glover, Will Smith and James Belushi. “She was beautiful, without a drop of makeup, very natural,” Silvia Fernandez said. Police arrived and made sure Beyonce was able to exit without incident. Beyonce, 31, cut a striking image, with her hair styled into cornrows. She was wearing a patterned yellow ensemble which showed off her legs while rapper Jay-Z, 43, looked like the quintessential tourist in shorts, a blue T-shirt and hat. La Guarida staffers showed The Associated Press pictures of the two dining on typical Cuban creole favourites – fish, chicken, black beans and rice – accompanied by their mothers. The privately run restaurant is famous as the filming location for the hit movie Strawberry and Chocolate, and is a mainstay on Havana’s tourist circuit. 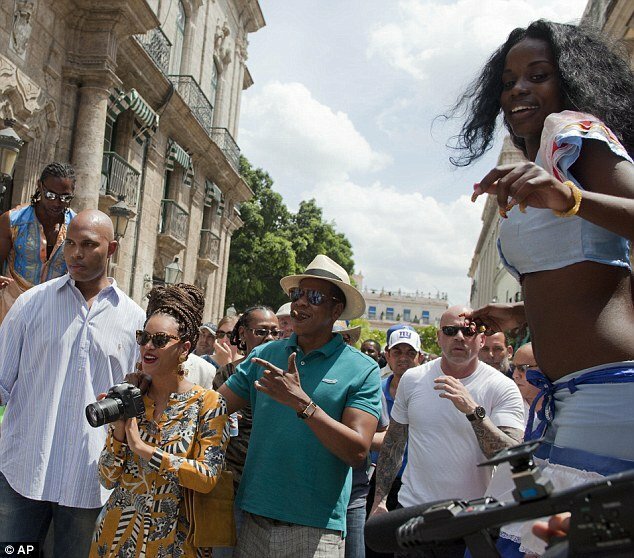 Beyonce and Jay-Z – who married in Paris on April 4, 2008 – toured colonial Old Havana wearing dark glasses and were surrounded by bodyguards and excited fans. She posed for pictures with local schoolchildren while Jay-Z puffed on a Cuban cigar, and then they popped into another restaurant that boasts a rooftop terrace with a sweeping view of the harbour. Beyonce and Jay-Z declined to speak to reporters, and it was not clear why they travelled to Cuba. State-run website CubaSi called it a tourist trip. The Obama administration eased many of the restrictions in 2011, but tourists still need a special visa or to be part of an organized tour. In the past, artists who were challenged by the government have said they visited for cultural purposes.